This is one of my favourite quotes. We all want change. We want other people to change. We want our environment to change. We want circumstances to change. Many manufacturing management teams look for the silver bullet to create immediate change, but do they want change? Do YOU really want change? 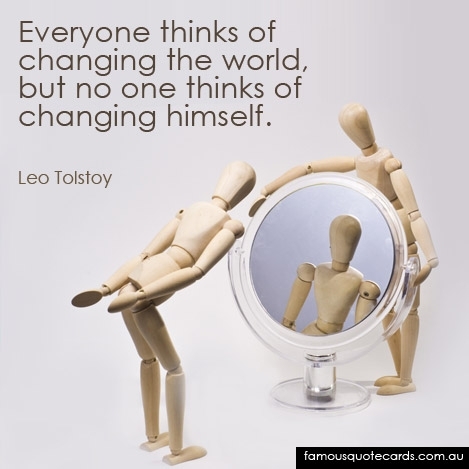 I am convinced that change requires many things, but it starts with the courage and commitment to look in the mirror. Do you sometimes think that there is nothing left for you to learn? Do you have the need to tell everyone how smart you are? How easily can you express regret? How well can you accept constructive feedback? When you make a business-related decision, do you have the company’s long-term vision in mind or do you go for immediate financial gains? Do you play by the same rules as everyone else or are you the exception? Do you feel that because of your position you have the right to make negative or derogatory comments to the people around you? It is important to understand that you cannot change people but YOU can keep learning and growing in order to help them want to make changes. My goal is to inspire extraordinary leadership at all levels of the organization. If you want things to change, you’ve got to change. If you want the work environment to get better, you’ve got to get better. Anything is possible if you develop a “grow together with me” attitude.